If you can afford a mirror in which to look? They were produced in the Former USSR.. 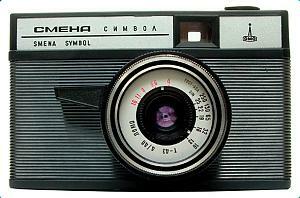 So we're talking about a Lada camera. Unfortunately no mirror could ever be big enough to contain the self importance of the rich, so there are always lots of smaller pieces broken off and pretty much just laying around. Sorry about your camera, dsio. 2.5 centimeters above cork? 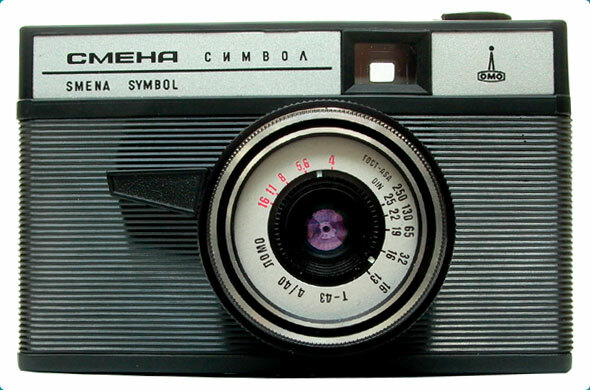 The Smena looks like it's got a lot going for it, maybe it's a Zil in sheep's clothing? More than a few people miss the economic certainty that the USSR brought with it. Not that they miss all of the features of the olde country. That same Camera I distinctly remember dropping on hard tiles from greater heights, and throwing around inside my laptop bag. And it was something that small. I've dropped fine china from 4 feet onto that cork floor, and its bounced without breaking. Of all the places for it to happen I just can't believe it was that. OK, well I just bought a new camera off Ebay. Its a 2.1MP camera, with litium ion battery packs (uses the same as my Sony DV video camera), memory sticks, and a large 5X optical zoom barrel lens. What do you guys think? I paid about AU$100, or about 40 GBP for it, including 2 memory sticks, and 2 litium batteries. Mint condition. I don't cameras so I would really need your opinion. This camera is specifically for tripod use, taking photos of items for ebay / sale / business. So all photos will be going on the internet, with none being printed out, which is why I didn't mind it being a 2.1. Aside from that, is there anything you can tell me about it (optics and features wise). Oh yea definately max res every shot. Its only 700kb per shot for 2.1MP on fine setting, and I have a 1GB memory stick, a 512, a 256, a pair of 32s, and a 64. Me thinks many photos! Anyone that says digital zoom is good deserves to be shot ...and not in the head..somewhere where it will take days, weeks to bleed to death. Raw files are usually only used for DLRS. People DO care about the file size. Not everyone has big memorysticks. My brother hs four memory sticks, a 256, a 512, a 1gb, a 32 and a 128. He came back from Brazil with every single one full to the brim. If he'd used RAW, he'd probably have barely a patch on what he got now. As for DLRS, they are so cheap now that anyone in the £400 budget should consider the extra £100. True that RAW does take up a lot of space, but there's definately no arguing the quality that the file produces. My point was mainly the using the current JPEG compression algorithms, digital zoom bites the big one! Na, I havn't really had a great zoom lens camera. My P71, and every camera before it has had about a 3X optical zoom, and has been a point and shoot variety. The thing I notice is I couldn't get anything smaller than about a 4 inch area into focus with any previous camera, while I've seen people use this camera (I believe the term is macro zoom) to take images smaller than postage stamps with brilliant quality. None of my cameras have ever been that good. They've been jack of all trades things. The plan is to have 2 cameras. I have already bought this one on ebay (The DSC F505) and its going to be my home use, tripod camera (I have a brilliant $1000 tripod from the DV camera). Its not practical to use on the move at all as its too big, and looks silly. The second camera will be a Sony P93, which I have found in a local paper, and should be able to get, with a 512MB and a 256MB stick, for AU$200. So for AU$300 total, I will end up with two cameras, the P93, and the F505, which should cover both purposes. I just honestly think its impossible to find a camera that will fill both rolls at all let alone at a reasonable price point. The new price of the F505 here was AU$1800, so I'm happy getting it for $100. Spending 400GBP on a single camera, when my last one was destroyed by a drop is insanity to be honest. I'm never spending more than $300 on a camera again. Got a sample pic from your new camera?